screenwriter will be one step ahead of their competition if they understand what studio executives and producers look for in a script. You already know this, and that’s why you’re here to look at one of the most successful animated film franchises of all time … Shrek. In this article, we’re going to take you through the Shrek script. We’ll look at its story, format, and structure. We’ll break down why the Shrek script worked so well in building DreamWorks Animation into the top-tier animation studio it is today. 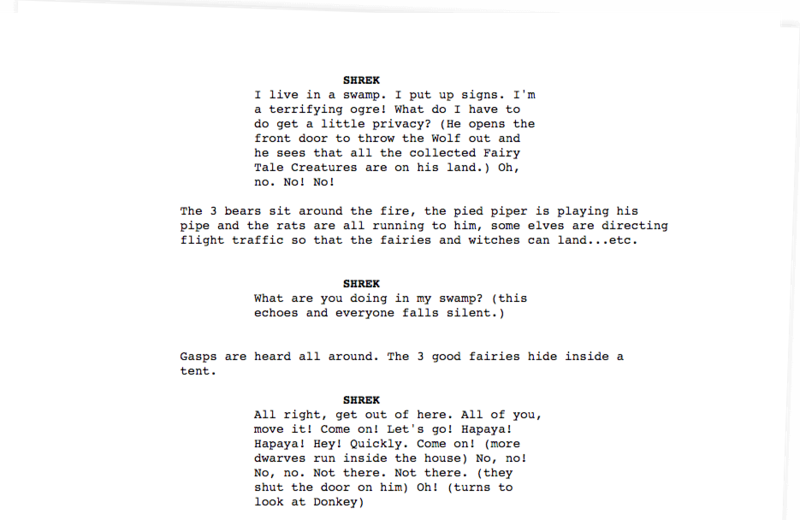 And of course, we’ll give you a download of the entire Shrek script PDF so you can study the work of the pros. Along the way, you’ll even discover why ogres are like onions. Did you download the entire Shrek script PDF already? If not, do it now. We'll be referencing the Shrek script throughout this piece — and even if you stop reading right now, you'll still want the Shrek movie script for your "learning files." Trust us. The animated feature film Shrek was DreamWorks Animation’s fifth feature film, and it went on to win the first-ever Academy Award for Best Animated Feature. That was huge, but there was something even bigger at play. The first film was released in May of 2001, and it grossed $267,665,011. It was then followed by three sequels, plus a spinoff, and now the Shrek film franchise is valued at $3,510,794,482. The film took four and a half years to complete and was one of the first animated features to heavily rely on computer animation. Scripts that generate three billion dollars merit analysis because the single most important thing to a film studio is a return on their investment. You NEED to pay attention to why this script worked, and take lessons from it to inform your writing style. If you can write scripts that have a clear path to making money, you will have a career in screenwriting. Writing to make money doesn’t presuppose your work can’t be creative and fresh. There is something to reimagining story structures and formulas by embracing them and then exposing their flaws. Read the Shrek full script and you'll see the appeal of this approach. DreamWorks used Shrek to turn themselves into the "bad boy" of children’s animation. Yes, that’s a bit of an oxymoron, but that’s what they did. So, let’s round up all the fairy tale creatures we can find, and break down the Shrek script to find out what made this film such a success story. Shrek is the anti-fairy tale, but the structure of the Shrek script follows a classic fairy tale template. A hero is called to action, reluctantly accepts the journey, and returns home along with a new world order. Here's a summary and breakdown of the Shrek full script, act by act. Shrek is an ogre living in the swamp. He just wants peace and privacy. Lord Farquaad is a local government official rounding up “fairy tale trash” because they are “poisoning his perfect world.” A talking Donkey escapes and is saved by Shrek. Lord Farquaad wants to be King, but the Magic Mirror explains that he must first marry a princess — the beautiful (and cursed) Princess Fiona. Farquaad’s apartheid government is forcing “fairy tale creatures” to seek refuge in the swamp where Shrek lives. You may notice a common screenwriting tactic in the clip below. A screenwriter has a character in their script run through a quick summary of the current situation. At the beginning of the scene, Donkey becomes the amusing "explainer." He catches us up on the story. How does the Shrek script go further? The writers use Donkey's run-through as a springboard to convey insight about the characters. Back to the story: Shrek wants the fairy tale creatures out of his swamp. He goes to the castle to file a complaint, but leaves as the Champion of DuLoc, and must now retrieve Princess Fiona in exchange for his swamp. ogres are like onions how, exactly? As Shrek explains to Donkey, "There's a lot more to ogres than people think." Ogres are like onions. They have layers. There's more to both onions and ogres than meets the eye. In the Shrek script, the writers key into the complexity and depth of the main character with a humorous simile: Ogres are like onions. It's what makes Shrek different. It's what challenges our ogre expectations and makes Shrek unique. It's why we pay attention and invest in his story. A funny answer to the question every screenwriter needs to answer: "Why should we care?" The second act of the Shrek script begins with Shrek and Donkey traveling to a volcano. They must fight a dragon before they are able to free Fiona. She has been waiting many years for a “Knight so bold” to rescue her. On the return journey, we quickly learn that Princess Fiona has a curse placed over her that leaves her human by day, but transforms her into an ogre by night. Only once Fiona can find “true love’s first kiss” will she “take love’s true form”. The next day, Shrek hands Fiona over to Farquaad, who gives Shrek the deed to the swamp. Shrek and Donkey have a falling out over a simple misunderstanding, and this leads to the ogre realizing that he has feelings for Princess Fiona. Shrek and Donkey fly off on a dragon toward the castle to stop the wedding. Shrek arrives just in time, and Fiona has an opportunity to show her transformation. Lord Farquaad orders that they both be captured. Shrek and Fiona fight off the guards, and the terrifying dragon swallows Farquaad in one gulp. Shrek and Fiona kiss for the first time and the curse is lifted. She transforms into “love’s true form” which, in this case, is that of an ogre. Shrek tells her how she is beautiful regardless. Why is the Shrek franchise so successful? Well, obviously the franchise is successful because of the first Shrek movie script. Just to check in, you've downloaded your free Shrek script PDF, right? If not, what are you waiting for? The movie Shrek was successful for a number of reasons, but one of the biggest was the fact that this multi-billion dollar property, owned and copyrighted by DreamWorks, coat-tailed off popular public domain characters to draw viewers to the theatres, theme parks, games, and merchandise. In doing so, their marketing strategies have reinforced their now-unique privately owned intellectual property, despite having roots in the public domain. Public domain is a term used to describe any material that is owned by the public and is therefore not protected by intellectual property laws. This includes patent, copyright, or trademark laws. There is no restriction when using these materials, no prior permission nor clearance is required for use, and no one can ever own these materials. Intellectual property that falls into the public domain is often material that was created long ago, and would be difficult to prove any ownership of the materials by any living person or estate. The United States passed a law that expires the copyright on any work published before 1923. Material that is owned by the public. Not protected by intellectual property laws. No one can ever privately own these materials. If you enjoyed a particular fairy tale or bedtime story during your childhood, there is a pretty good chance it was referenced in the Shrek script, and that is one of the biggest reasons for the film's great success. And a marketing slam dunk. If you want to know more, check out our guide to finding screenplay ideas from the public domain. The article gives you great ideas, and walks you through public domain info for storytellers. DreamWorks did not have to pay expensive licensing fees, and they were able to take a bite out of its biggest competitor, Disney. Some believe Shrek was Jeffrey Katzenberg and DreamWorks sending a shot across the bow at Disney Animation, using the evil Lord Farquaad as the humorous depiction of Disney CEO Michael Eisner. Multiple pokes at Disneyland can be found throughout the entire Shrek script as well. The Duloc mantra: "Don't make waves, stay in line, and we'll get along fine." Just one sample of a dig at Disneyland in the Shrek script. Disney has been known to use IP found in the public domain for their animated features, and like DreamWorks, they do not own Snow White, The Gingerbread Man, Pinocchio, Peter Pan, nor any of the countless fairy tale characters found in their respective films. DreamWorks does, however ... own Shrek. Katzenberg was chairman at Disney for ten years, and you know he carried over a few of his ingenious Mickey Mouse tricks. Download our FREE Shrek Script PDF so that you can see how Dreamworks structured their cultural phenomenon. When Shrek was released, DreamWorks animation used characters and stories from the public domain in sixty percent of their projects. Those properties performed better than the ones that used purely original, or copyrighted material. Public domain stories translate to TV as well. If you want to make your own marketable television shows, be sure to check out our free Master Class on TV writing and development. Shrek was also successful because it was relatively simple. That isn’t to say making Shrek was simple. Far from it. It took $60,000,000 and four years to complete the project, but DreamWorks didn’t complicate the story or themes to the point of alienation. Shrek was versatile, it mixed fantasy with comedy, and it played well across the entire country (and globally) as a family experience at the theatre. It spoke to families no matter where they lived. This all started with the Shrek script, which was inspired by the children's book Shrek! If you live in the more humid areas of the United States, you might identify with the indifferent Ogre who just wants to be left alone in his swamp. Or the tough anti-princess who is tortured by her body image until she finds someone who thinks she is beautiful no matter what society says. What if you’re a blue-collar family from the Midwest? You might find some solace in a world that values dirt and grime, much like Mike Rowe did with Dirty Jobs. A world where your tough nature or rural attitude were valued, and not mocked. You might find yourself identifying with the sassy, yet charismatic Donkey, who is harassed by the police simply for having a voice. Viewers often take issue with films that have an overt political message or tone, but somehow DreamWorks and Shrek were able to hover above suspicion by sticking with funny fight scenes, random references, and some low brow humor — all while sending surgical strikes at Disney. Many found the mixture of adult humor laced into a family film to be refreshing. It was one of the early instances where parents could take their kids to a movie, and have a chance to enjoy the film. This has been a huge part of why superhero films and kid-friendly animated features have become the tentpole that holds up studios today. Children (for better or worse) now drive much of the economy, especially in Hollywood and entertainment. A parent, who normally would skip the movies, will buy tickets for their kids, their friends, their snacks, and they chaperone the entire thing, which means at least one adult ticket sale. All in all, the Shrek script has something for everyone. He was the face of fear for many others, but the fear he felt came when he was emotionally vulnerable. Emotional vulnerability is much more common in modern storytelling when compared to the classic fairy tale. In the past, humans worried about beasts and godlike forces, but you don’t need to fear starvation when you have grocery stores. You don’t need to fear harsh winters when you have central air. Emotional vulnerability is not so easily banished. The film is an adaptation from a children's book, Shrek!, which was published in 1990. The Shrek book was authored by William Steig. The title Shrek is based on the Yiddish term for “horror” or “terror.” (Brooklyn-born Steig was of Polish-Jewish descent.) The film is loosely based on the book, and the main consistencies are ugliness and the anti-fairy tale — themes Steig explored in his art. Steven Spielberg actually bought the rights to the Shrek book, but then sold it to DreamWorks animation is 1994. Spielberg saw the obvious value in a story that took an unconventional approach to fairy tales. Jeffrey Katzenberg must have felt the same way because he went into production soon after the purchase. The book did not feature all of the extra fairy tale characters found in the film, so this had to have been a decision made during the adaptation phase. It gives you some insight into how studio executives think, and how they transformed a thirty-six-page children’s book into a massive movie franchise through the public domain. Shrek isn’t easily mimicked, mainly because it cost a lot of money to build, and a huge amount of animators and crew to put it together. That isn’t to say that the lessons of the Shrek script aren't easy to replicate, though. As important as a the Shrek script is, it truly is just a set of goals on paper. Writing your own script will cost you nothing more than energy and time, and people like Jeffrey Katzenberg are constantly looking for new material. Does your script have built-in intellectual property? Will it sell in coastal America? Will it sell in the Midwest? How about in the South? Does it have a global audience? We know, we know … you’re a creative person. You should only be burdened by creative decisions, like what cool hat to wear or something. The less you know about the business side of filmmaking, the more you’ll be held captive and controlled by the financial realities of filmmaking. Haven’t downloaded the full Shrek movie script yet? Enter your email below, and we’ll send it your way in 10 seconds. You know all about how the Shrek movie script used public domain to help their film, but you still have questions about public domain itself. So go check out our Screenplay Ideas From Books & Poetry in the Public Domain which goes even deeper, and will help you sort out your own project concepts that use property from the public domain. Subscribe to our Youtube channel and follow us on our Instagram page. Can you do the Transformers Live Action Film Series?